If you are Nokia mobile device’s users and just purchased a new device or a charger recently, then you may be interested with this piece of news. Nokia has just announced a new exchange program with intention to replace all the potential faulty charger units manufactured by its vendor, BYD in the market due to safety reason. The issue is believed to be due to the exterior plastic cover that become loosen overtime, exposing internal electric circuitry that potentially pose electric shock to its users. Although there is no real incident being reported yet, but the Finland based company has taken initiative to replace all of them voluntarily as a benefit to all. The impacted models includes AC-3U, AC-3E and AC-4U manufactured in certain date ranges. AC-3U and AC-3E manufactured between June 15 until August 9 2009 as well as AC-4U manufactured between April 13 until October 2009 are believed to be affected so it is advisable to stop using them immediately while waiting for free exchange. Since these charges could be bundled in the mobile phone package or sold separately as an optional accessory, so unless you are pretty sure that you have purchased the charger model before April 13, else it would be good to check it at Nokia official website for free exchange. 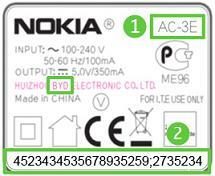 In order to check if your Nokia charger is impacted, be ready to get your charger on hand and just look at the printed label for AC-3U, AC-3E or AC-4U with manufacturer name of Huizhou BYD Electronics Co. Ltd, followed by the exact identification number as highlighted in the label.